Welcome to our intriguing Caribbean-style home "that nature designed". 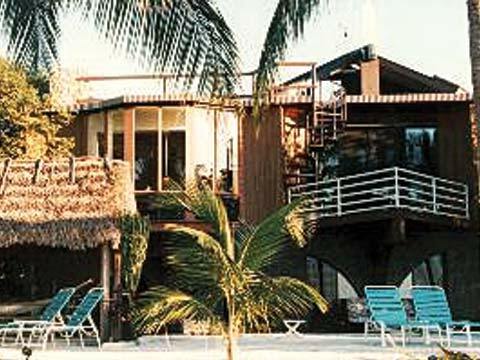 The Barnacle is located on the lush tropical island of Big Pine Key, FL., where peace and quiet with leisurely breezes prevail. Escape the hectic world of "civilization" on our palm covered beach with a panoramic view of the ocean and sunset. Relax on our private, sandy beach with shallow, rocky shoreline or enjoy our tiki hut. You can hang out in the hammocks, take a nature walk, soak in the hot tub, ride a bike, or take a kayak ride -- here your time is your own. This one of a kind jewel is found on the Atlantic Ocean in the Lower Florida Keys. The villa has very unique bedrooms with private baths. The Blue Heron Cottage with kitchen, one bedroom, and bath is a treasure in itself with stained glass windows and private porch. Upon entering the large open air atrium where breakfast is served, you can enjoy the jacuzzi and landscaped waterfall and pond. Look out on the beautiful ocean view while sitting on the deck or entertain under tiki with barbeque grill.